It is critical that 4 wheelers understand the capabilities of big rigs, in order to share the road safely with them. Cars are the greatest potential hazard for the trucker. Not the road conditions or the weather. Not other big rigs. Cars. They can be unpredictable, there’s a lot of them and most don’t realize the dangers of messing around with a rolling truck, trailer and load, weighing 80,000 lb. or more! Most four wheelers have no idea what dangers lie in wait, when they drive close to an 18 wheeler. Understanding the limitations of a big truck will help to keep you safe. These are some simple, yet very important tips you should know about sharing the road with big trucks. Don’t travel close to trucks. Big trucks DO NOT have the same ability as cars. They cannot successfully stop quickly. They require a lot of time and distance to stop safely. Trucks have large blind spots. Big trucks also have several blinds spots where the trucker CANNOT see cars around his vehicle. He has a great deal of difficulty seeing what’s going on to the right of his vehicle. This is an especially large blind spot. Therefore, it’s best not to pass a truck on its right side if it can be avoided. In fact, don’t hang around on the right hand side if you can possibly avoid it. Truckers cannot see cars which tuck themselves in behind the trailer. Don’t get in front of the truck. Speeding up to get ahead of a truck, then pulling in front of it and slowing right down is a very dangerous practice. That truck is very close behind you. There’s a good chance the driver of the truck won’t be able to see you over the long hood. If you make any sort of an unexpected move or error and loose control of your vehicle, the truck may not be able to avoid running into your vehicle. Do not pass the truck on the right, when the truck is turning a corner. They require a lot of room to maneuver safely. As the trailer begins to follow the truck around the corner, the distance between the curb and the trailer will close in and will crush anything that gets in that spot. There’s a great deal of weight coming around that corner and a lot of momentum. The last place anyone would want to be in a small car is beside the truck when it’s turning right. The trailer will track over top anything in it’s path. It’s an easy way to get killed. Stay away from trucks when they’re turning. Don’t hang around trucks. 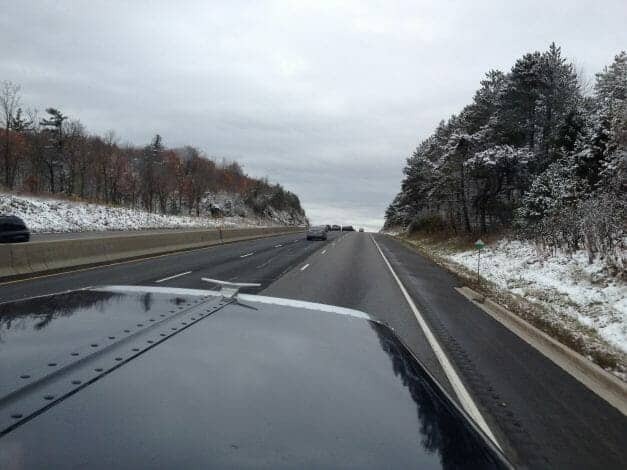 Sharing the road with semis, means not hanging around them when traveling on the highway. Move past them and away from them. If it’s necessary to pass a tractor trailer, pass them on their left hand side. Pass them quickly, maintaining a consistent speed and get away from them. The closer you are to the truck, the greater the risk of an accident. 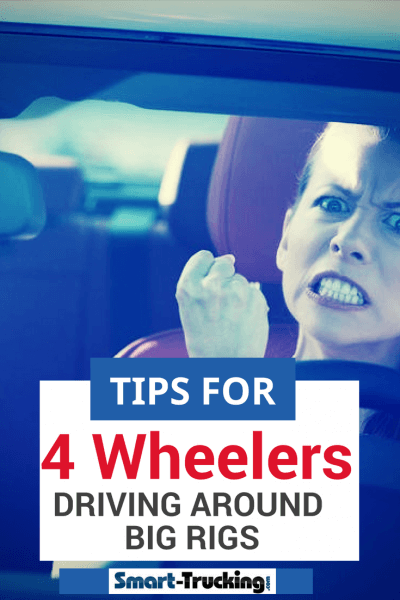 In general, try to avoid driving close to them at any given time. Drive at consistent speed around big trucks. Avoid making any sudden moves. 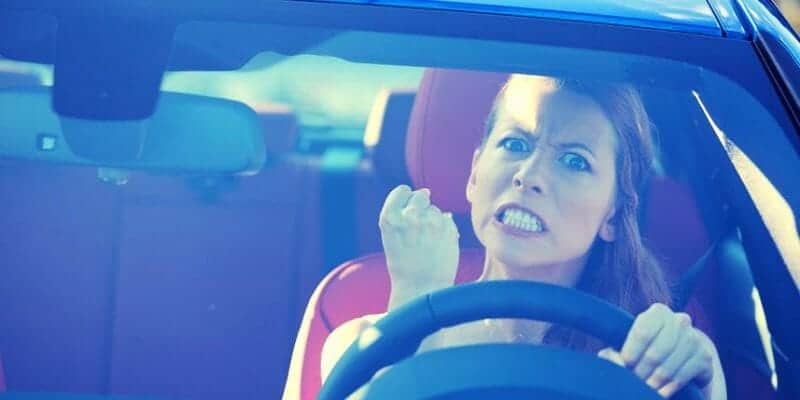 When you’re driving your car, move slowly and be predictable with your actions. One of the hardest parts of being a professional driver, is trying to guess what the guy in the car is going to do next. If you need to change lanes or turn, signal well in advance. Change lanes or make your turn when you are far away from the truck, where he can see you and clearly see what your intentions are. When a car driver slams on the brakes at the last minute and turn a hard corner, they startle the truck driver. As a result, he may not be able to react to this move in time to avoid hitting the car. It’s vital to move smoothly, move predictably, signal well in advance of a move, so the truck driver isn’t trying to guess what the next move is. Truckers are pretty good guessers. However, sometimes they can guess wrong. That’s when accidents happen. If you must be near a truck on the highway, travel on the driver’s side. Truck drivers can see you best when you’re on the driver’s side of his vehicle. That’s his area of best visibility. Anywhere else isn’t particularly safe, so avoid those spots. Four wheelers must understand that when sharing the road with eighteen wheelers, it is not smart to challenge an 80,000 lb. tractor trailer, moving at highway speeds. I am always surprised when I see so many people driving cars on the highway, how they will flirt with danger when driving around big trucks. If a car and a semi get into an accident, there’s absolutely no doubt as to who’s going to be the winner. Tractor trailer accidents are almost always deadly. Why take such an unnecessary chance? Why risk your life? Stay away from them as much as possible, whenever possible. Be smart. Be safe. Do not take risks when driving around big trucks. Sharing the road safely is possible, by following some simple common sense advice.